The film genre that might be called Old People Behaving Hilariously gets an appealing new entry with “The 100-Year-Old Man Who Climbed Out the Window and Disappeared,” a sometimes daffy, often droll Swedish movie. Among other things, this film dares to ask the controversial question: Can a cadaver dog distinguish between a body that’s dead and one that is merely triple-digit old? Allan (Robert Gustafsson) is about to be honored with a 100th birthday party when, for no particular reason, he decides to climb out the window of the retirement home where he lives and do some aimless traveling. How aimless? “Can you travel somewhere from here?” he asks the ticket clerk at the local bus station. A customer with an urgent restroom issue leaves his suitcase with Allan, who promptly boards a bus with it, not realizing it is stuffed with cash. That sets off an adventure in which he is pursued by various nefarious types, most of whom come to unfortunate ends. It is one of these whose body draws the attention of the cadaver dog, but the police official investigating the increasingly odd string of events Allan is leaving in his wake is inclined to discount the dog’s report, thinking that perhaps Allan is causing a false reading. As Allan ambles on, he picks up some friends and an elephant, and we also learn about his rather eventful life through flashbacks. Turns out the fellow was a catalytic force in some major historical events. Who knew? 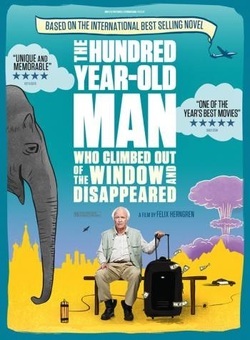 Although the names are absent from the credits, it's impossible not to note the handiwork of Scandinavian scribes Forrest Forrestgumponsson and Zelig Zeligsson on the jolly, geriatric romp The 100-Year-Old Man Who Climbed Out the Window and Disappeared. Adapted from a best-selling Swedish novel and directed with a slapstick verve by Felix Herngren, the movie with the title too long to type again is about one Allan Karlsson (Swedish comedy star Robert Gustafsson), an impish centenarian who recalls his fateful encounters with a pantheon of 20th-century figures: Francisco Franco, Joseph Stalin, J. Robert Oppenheimer, Harry Truman, and Ronald Reagan, to name a few. Intercut with the history-bending flashbacks is a present-day story in which Allan escapes his retirement home, somewhat innocently takes possession of a suitcase, and hops a bus out of town. The fact that the suitcase is full of money and that the money belongs to the head of a biker gang in debt to a British gangster means that Allan - and the friends he meets along the way - becomes the object of a desperate manhunt. A bumbling local police official is on the lookout for Allan, too. Throw in a circus elephant, a tough cookie named Gunilla (Mia Skäringer), and the comically, chronically indecisive Benny (David Wiberg), and this peripatetic farce practically propels itself. Allan's penchant for blowing things up supplies a narrative through-line - not to mention a few, um, explosively funny gags. If the accidental adventurer's motto isn't as sticky and sage as Forrest Gump's "box of chocolates" line, it does reflect a certain Nordic existential bent. "Life is what it is and does what it does," Allan says. Put some umlauts on that, and call it a day.